JaJuan Johnson enters the pros after a great Purder career trending upwards as winner of the Big Ten MVP. 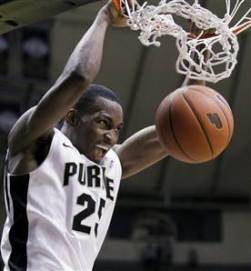 At 6'10, Johnson provided a threat at Purdue by outrunning opposing big men in transition, using his great jumper, and shooting turnaround jumpers from the post. Offensively, Johnson plays with a high skill level. He can hit jumpers from anywhere, including the 3. When not scoring with his jumper, he posts up and uses turnaround jumpers and jump hooks. Athletically, while not possessing a very strong build, he routinely beats defenders down the court for easy baskets. If defenders are up on him while he has the ball on the perimeter, he has shown the ability to take one or two dribbles and shoot a jumper. One thing to note is that he will not be able to post up in the NBA due to lack of strength and was pushed out of the paint by strong college players. He will be a great 4-man that will need to feed off of creating guards such as Rose. Outside of scoring, Johnson did show the ability to pass back out of a double team as he was doubled often. Right now, he is not strong enough to be a great threat for pick-and-roll due to weak picks that will be set. Until he adds some weight, he will struggle in terms of finishing around the basket despite his wiry strength. Defensively, Johnson possesses freakishly long arms to disrupt shots and play the passing lanes. However, with Johnson's lack of strength and not much experience defending pick-and-rolls as he played the five, it will take a while for Johnson to the defensive demands of an NBA PF. Currently, he is not strong enough to guard low-post players, and while he increased his rebounding to 8 rebounds a game, he is not a very strong rebounder. JaJuan Johnson is likely to have a long career in the NBA, but for a limited role initially. He has great strengths in terms of skill level, long wingspan, and size with decent athleticism. However, he also has major weaknesses lacking in strength, rebounding, and question marks surrounding his toughness. He'll likely initially play the roll of stretch four who can run the floor and block some shots for 15-20 minutes a game. He reminds me of a David West type player. His game is suited for being a good shooter at his size, providing solid athleticism, has several flaws, will not be a star player, but like David West, he is a senior that is a steal in the late first and will be in the league for a while. I see JaJuan's draft stock increasing throughout the draft and possibly being outside of the Bulls range. How Does he Fit on the Bulls? Currently, I am for Bulls taking players that will stay on their roster. However, my first priority is to try to get someone that provides more of an impact and toughness for Coach Thibs or a Shooting Guard that fits our need; if one that can play in the league is available (don't settle). If we cannot trade up for a more defined impact player, than I am definitely for drafting JaJuan Johnson and thinking we get a steal. I think he provides skills that translate to the NBA, provides a solid basketball IQ, would be a great floor-spacer for Rose while working well with either Noah or Asik. He'd provide a scoring threat off the bench and more depth to our front court in case we are interested in using some of our front court players for trade bait. His length will also be an asset in Thibs defensive philosophy. Sounds like Channing Frye. No? Like I said, I could see the Bulls trading Gibson for a SG and then drafting JJ. I said last year, this is the JJ to get, not James Johnson. Camby is a phenomenal rebounder and was a horrific jump shooter who developed into an okay open jump shooter after a lot of time. It doesn't sound like him at all. It sounds more or less exactly like Channing Frye to me. Granted, I'm not watching him, so maybe the description is off, but Frye was a high skill, finesse post guy with mediocre athleticism. Given that this guy plays in the Big 10, lot of Bulls fans might be thinking he is great because they watch him so much. At this stage, the Bulls just need to draft the best player they can get who can then be a backup at any spot(we need backups at every spot in a way) or this pick once he develops can be used as trade bait. Look at Taj or Asik....would their value be so high if they played for Sacramento or Minnesota? We can use a PG who can backup Rose or a SF to spell Deng or a PF/Center in case of injury, SG obviously. I don't know where all this Watson criticism came from suddenly. The guy played like 6 minutes a game against Miami, hard to demand too much, yet I still think he plays well and I'm not buying the 2 guard label people always want to stick on him. He missed a lot of open shots like a Bogans and was very inconsistent in the playoffs. And he dribbles around a lot before he sets up a pass with time running out on the clock. He seems to be more of a volume shooter and maybe he is better fit as a 3rd guard if we get a decent SG. Agreed, that he played less minutes to demand too much. His defense in general also was pretty good. At the C/PF position (5/4) Bulls are five players deep. Why do you list Noah as a one way player and not Gibson? Per 36 minutes Noah scored more points, on a better percentage from the field and from the line, grabbed more offensive boards and had twice as many assists. The only thing Gibson does that Noah doesn't is shoot a couple of jumpers a game (at below league average percentage mind you). I don't really see how a PF fits as a pick. Either the Bulls are going to roll the dice on Boozer being able to play better next year, in which case Gibson becomes expendable because the Bulls have one too many front court players already, or they feel the need to hedge their bets on Boozer, in which case keeping the known quantity in Gibson makes a lot more sense than relying on a rookie. I don't know, I just see any PF the Bulls draft being in a James Johnson type situation. The team is in win now mode and unless a guy can beat out the competition they just aren't going to get time. And the only position that's likely to happen at is SG. As I see it the Bulls have to pick a SG they think can contribute, pick a Euro they don't expect for a few years, or trade the picks. In a draft, you usually take anybody that can make a roster this late in the game. Also, with our assets and just needing a piece you develop depth in case you trade. What if all the real shooting guard prospects are gone by time we pick and we could not trade up? I agree wholeheartedly, you go for the best player(talent) available, especially at the end of the first round. Watson played well, and I think he will improve his shooting as he becomes comfortable in his role. I went to purdue and watched JJ play in person many many times, to be honest picking him is a gamble at best, but what more can you hope for this late? Obviously we should only grab him if the SG situation is resolved. Cool man; he is skinny and the toughness may be questioned. What I like about him is his shot and athletic ability. I don't see many players with that combination at his height. I think shooting alone transfers. However, the question remains is he a Brian Cook type player or may he be better? Hey Kev, how about a Marshon Brooks report? Will be posted up soon man! To me overall, I think this late in the ball-game you just find the BPA. I fill JaJuan would be one of the best available; maybe not completely the best available, but one of the better. I will post an article up on Jeremy Tyler sometime (I think that is who someone meant - Tyler Smith played for UTENN a year ago); Brooks will be up soon. Welcome back Kevin. Since Reggie Jackson moved up my best available are Charles Jenkins and JuJuan Johnson. Too bad my top picks available last year(D. Jones and L. Babbitt) both ended up in the D-League. I still think Jones will play/contribute in the NBA. Babbitt maybe? Thanks RW, Reggie Jackson has some freak athletic ability; just needs to put it all together. Jenkins could be good, but it might be a couple of years. The Bulls could have used(even started)Dominique Jones this year. I doubt he ends up near us but i think he could be a very serviceable player. We could always replace Pargo/Lucas with him on the roster. Knowing our bigman history, having extras will never be an issue for us. Are you going to do a story on Tyler Smith that played overseas? He looks like Deandre Jordan that went to play overseas? I think he could be a steal for us. Maybe even make some of our bigs expendable if he proves himself after a while. I think he has a lot of potential and could be great down the line imo. I will try too. Smith could be a steal, but he more than likely will be a second round pick. I been hearing some late first round talk. And in either nbadraft.net or draftexpress they had us taking him at 28. I think athletically he would be great regardless and u can never have too many athletic bigs. I think he is a little more versatile than Frye in the mid-range and provides more athletic ability. I don't think he is Marcus Camby either as Camby is more of a defender. I'd hazard a guess that if he were projected by NBA teams to be better than Channing Frye or Taj Gibson that he'd be a top 15 pick.